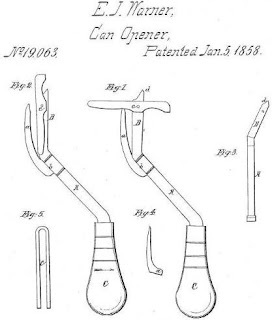 A brief history of the can opener might not be the sexiest topic for a blog post, but stopping what I'm doing to ask myself questions such as "how did people in the old west get their food out of the can? ", and then having to find the answer is part of the writing process. When I sit down to craft a story I probably spend as much time researching as I do writing--if not more. Especially if I'm working on an historical novel. I start a line of dialog and then wonder if a certain word or phrase was in use at the time, so I have to open a new tab on my laptop to look up the etymology of said word or phrase. Ditto, dropping in historically accurate details requires research. The minutiae of my characters' lives is what brings depth and texture to the story. They don't just sit down to eat, they have to eat something and it better be something available during that time period. For instance, a medieval knight in England would not sit down to a plate of roast potatoes because potatoes were one of the foods brought from the New World centuries after Sir Hubert sat down to eat his dinner in the 12th century. So, I spend a good amount of time looking up details about clothing, food, medicine, etc. 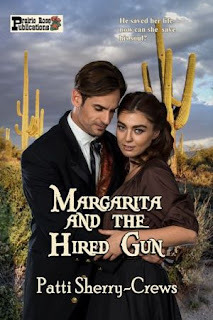 When I wrote my first historical western, Margarita and the Hired Gun, the two main characters spend most of the book out on the trail--for weeks on horseback. They had to eat, and though they did live off the land to some extent, they mainly had to rely on food they carried with them. This presented a problem for me because how would they keep food from spoiling on their long journey? In researching this question, I was surprised to find how early canned food became available. It would have been one of the foodstuffs Michael and Margarita carried with them in their saddlebags. In my current work in progress, I've once again put my characters out on the trail. In one chapter they sit down together to share a can of beans....but, wait....how do they open that can of beans? I never thought about that before. Hero and heroine stare mutely at one another across the campfire holding a can of beans aloft and wondering how to open it. Author, help us out here, their eyes seem to say. I quickly looked up when the first can opener was made to see what this thing would look like. 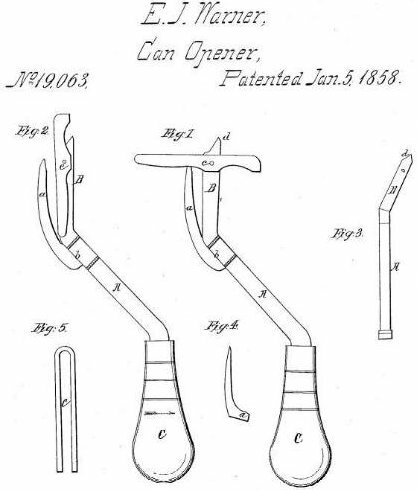 In 1858, Ezra J. Warner designed the first can opener. Warner's design consisted of a pointed blade with a guard made to puncture the can without going too far into it. Then a second, curved blade would be worked around the top of the can in a sawing motion. But, pay attention: Peter Durand got a patent from King George III for his canned food process in 1810. Notice that? Canned food was out there 50 years before anyone could figure out how to get the food out of the can! That's like building a garage around a car before envisioning the need for a door the width of a car. So how did folks open a can of peaches before 1858? Briefly, let's look at canned food, the need for which was a by-product of war. Needing to move troops great distances for long periods of time, Napoleon offered a reward to anyone who could solve the problem of feeding an army on the move. In 1809 Nicolas Appert first preserved foods by putting them in hermetically sealed and heat sterilized containers. Unfortunately these early containers were made of glass, which is not the ideal for rough travel. The first cans (short for "canisters") made by Durand were of wrought iron with a tin lining. In order to open them, the use of a chisel and hammer was recommended. As you can imagine canned food did not immediately take off with the speed of sliced bread. Then came the American Civil War and canned foods once again kept moving armies fed. Canned foods like oysters, meats, fruit, vegetables made their way to the general stores at this time. But early can openers were not user-friendly. The threat from the sharp blade and the jagged edges left on the open can was off-putting, so store clerks would perform the service of opening cans for their customers. 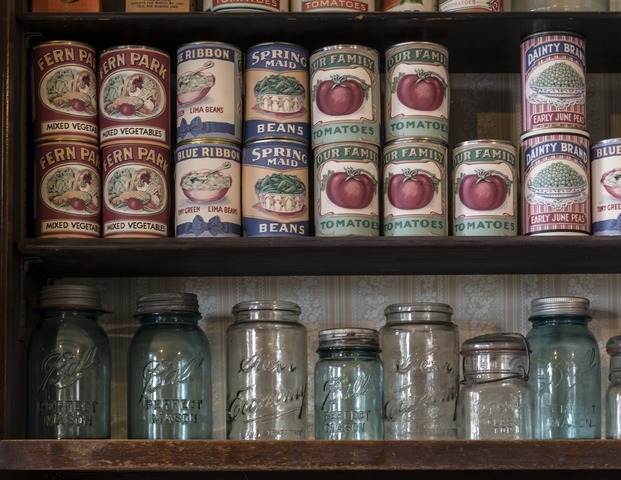 When I read that canned foods existed for such a long time before anyone came up with a good solution to get at their contents, I thought, "Talk about putting the cart before the horse!" Now, back to our campfire dinner: The hero holds up a can of beans and scratches his head. The heroine lets out a throaty laugh and pulls a Warner can opener out of thin air. Both turn toward the author and convey gratitude with their eyes. While you're waiting for me to finish this story, you can read a copy of Margarita and the Hired Gun, which is available as a single or you can find it in the collection, Under a Western Sky, six full length historical western romances at the bargain price of $0.99. Authors, have you come across any interesting facts while doing research? How much time do you spend researching vs writing? Do you have an go-to places to search out your facts? Readers, do anachronism stop you dead in your tracks while into a book? I'm so glad to know of the extent to which you go to be historically accurate. Nothing bothers me more than finding anachronisms in HWRs and, believe me, I've come upon a few doozies. Language seems to be at the forefront of this crime, but also things like songs being sung that hadn't been written for another 20 odd years--what does it take to look up things like that? Well, Patti, you obviously know what it takes. And on behalf of your characters, thanks for not leaving them with an unopened can. Thanks, Andi! I know you can be counted on for historical accuracy. I'm sure I've dropped a few anachronisms in my writing, but we do the best we can. I wouldn't leave those characters to go hungry. Of course, we could skirt around the whole thing and not skip eating, etc. but I hope one of the reasons people read historical fiction is to learn what it was like then compared to now. Thanks for stopping by. Oh, this post was so much fun. I love the author process and love it when others share their 'tips & tricks'. thank you, Doris! One "can" only imagine the number of can-opening related incidents back before someone saw the need for a device whose sole task was to open the darn cans. I even remember back in my young days how some of the manually operated can-openers left a sharp, jagged edge on the can and many the time I cut my finger on it. Glad you stopped by. Thank you for this, Patti. I've had my cowboys use a knife to open a can, but I'm glad to know there was a can opener available. 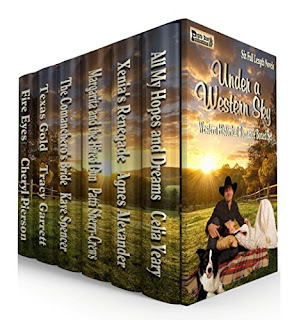 Got give one to the ranch cook in my next book. I'm like you, sometimes I spend as much time looking something up as actual writing. But I hate to see a glaring mistake in a book. Of course, I figure I've been guilty of messing up now and then, too. Hi, Agnes! Just the thought of opening a can with a knife or a hammer and chisel is giving me the willies. You're probably right to put the can opener in the hands of the cook. 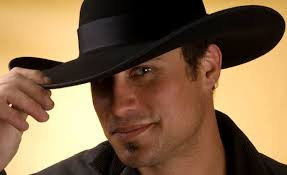 I'm not sure having one was a common thing for a cowboy out riding, but in my WIP the hero is moving back to Colorado after years out East and he may have gone overboard in outfitting himself (much to the amusement of the heroine who is more a roughing it kind of gal). thanks for stopping by.